Grilling on an outside pit and gathering around a warming campfire to swap stories or roast marshmallows rank as two of the more popular reasons for camping out. But as Texas state parks prepare for a busy Thanksgiving holiday weekend, visitors to some parks will face a variety of challenges to those two favorite pastimes due to the ongoing drought and continued wildfire dangers. More than 200 of Texas’ 254 counties are currently under a burn ban, affecting campers in dozens of Texas state parks, but restrictions vary as to the types of fire allowed. Some parks permit the use of containerized fuel (propane) stoves and/or charcoal grills with lids, but don’t allow wood or ground fires. Garner State Park has instituted a hybrid rule that allows campers to use wood or charcoal in barbecue pits or fire rings for meal preparation only with the understanding burning coals will be extinguished immediately afterward. Park rangers will be patrolling to enforce that policy. Camping enthusiasts should know that even in lingering drought conditions, a number of state parks, including Lake Mineral Wells, Possum Kingdom, Palmetto and South Llano River, are operating with no bans on traditional campfires or outdoor cooking. Planning ahead for preparation of campground meals, especially in burn ban-impacted parks, will result in a more enjoyable experience for the entire family, according to a Texas Parks and Wildlife Department camping expert. Davis recommends beginner outdoor chefs prepare meals over charcoal, rather than wood. That’s because cooking temperatures are easier to regulate and the charcoal can be ready to cook on within 20 minutes or less, while wood fires can take twice as long. Another “marvelous” option for campers, she says, is Dutch oven cooking, which can utilize either charcoal or wood coals – placed under the iron cooking pot and atop the lid – to regulate the cooking temperature. Each white-hot briquette equates to about 15-20 degrees, so you can control the heat as you would in an electric or gas oven. Everything from pizzas and enchiladas to stews and cobblers are ideal for Dutch oven cooking. Cooking with a propane-fueled camp stove is quite simple, according to Davis. With a little practice, cooks can prepare just about anything they would on a stove at home, as long they stir the food constantly to prevent what’s on the bottom of the pan from being scorched by the intense flame. Even if there is no burn ban at the park, Davis suggests minimizing campfire impacts by only building as large a fire as needed for the cooking purpose at hand, such as roasting weenies or heating s’mores over a campfire. Remember that county judges and/or county commissioners can implement a burn ban at any time, and restrictions can change rapidly to accommodate dangerous conditions. A state park will be affected if it is located in a county under a current burn ban, although it may be granted an exemption. To know what campfire and cooking restrictions are in effect at a given state park, inquire while making a reservation, visit the TPWD’s state park pages at: http://www.texasstateparks.org or call state park information at 1-800-792-1112, option 3, between 8 a.m.-5 p.m. Monday through Friday. If you’re new to camping or need to brush up on rusty outdoor skills, consider a Texas Outdoor Family outing with Davis and other TPWD outdoor experts at one of the following state parks: Cleburne and McKinney Falls (Nov. 12), Pedernales Falls and Dinosaur Valley (Nov. 19), and Brazos Bend and Estero Llano Grande/World Birding Center (Dec. 3). CROCKETT- The 20th Century’s most compelling decade will come roaring back to life in Crockett during one exciting performance on October 19 at the Crockett Civic Center. THIS IS THE ‘60s is a unique multimedia blend of live music, historical film clips, dance, fashion, and animation. 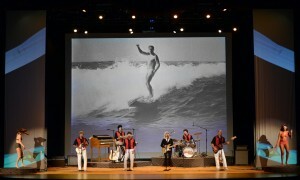 More than a stage show, and much more than a concert, THIS IS THE ’60s, takes the audience on a time tunnel journey that celebrates the 50th anniversary of major milestones in news, pop culture, and music history. From the early days of the space program, through the hysteria of Beatlemania, into the darkness of the Vietnam War, and the shining optimism of the Woodstock era, THIS IS THE ’60s merges that entire turbulent decade into a cohesive and enthralling stage production. AUSTIN–As the federal budget impasse persists well into the second week, the Texas Parks and Wildlife Department wants the public to know that the welcome mat is still out at the more than 90 Texas state parks.